It’s hard to find a compact mower that’s powerful enough to tackle a lawn bigger than the average size. And the difficulty only increases when you want it to maneuver around small static obstacles like small flower fields and shrubs. If you too are looking for a compact mower, but just cannot find the right one, you’ll be glad to know I faced the same dilemma. It was when the neighbors hired us to trim their 1-acre backyard. They had set up a beautiful tomato trellis garden, and I couldn’t see how to navigate around them and get the job done in time. But I had a certain mower brand in mind which I wanted to try, and I am glad that I did. The Snapper zero turn riding mowers I found to my delight to be the perfect fit for the job. But will they also be suitable for your needs? Let’s revisit my experience and see if we can find that out. 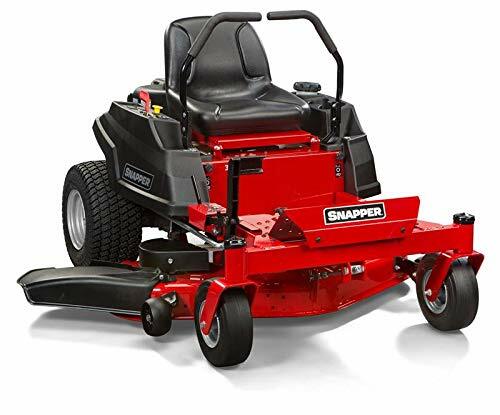 Snapper 46 Inch Riding Mower Reviews 2019: What did I like about it? What Could Have Been Made Better About This Lawnmower? Snapper 360Z Reviews 2019: What did I like about the 52 Inches Zero Turn Mower? What could have been better about this lawnmower? 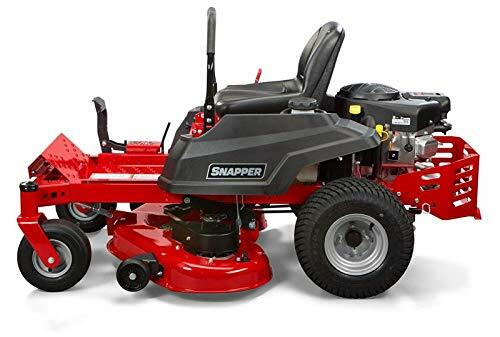 Snapper 24 HP 52″ Mower Review 2019: Will it be your choice as well? This lawnmower is part of Snapper’s 360Z Zero Turn Series which has mowers of a wide range of horsepower and blade cutting sizes. The sheer variety in this series is really impressive, and I guarantee that you will find one that exactly suits your needs. 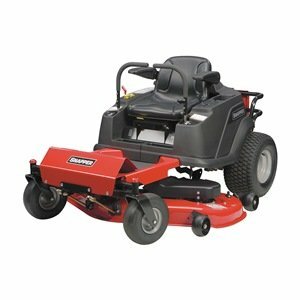 The Snapper 46 inches 724 cc mower comes in at an intermediate position in this series of mowers, situated in between the most expensive and the least expensive of its class. So let’s move on to the best and worst features of this one. The best thing that this mower has going for itself is the super efficient 22 HP Briggs and Stratton twin engine which unleashes 724 cc of mowing power whenever you turn it on. It is a 4-stroke engine with a total fuel tank volume of 3 gallons. It can go up to a maximum of 6 mph in the forward direction, and up to 3 mph while backing up. Turning this lawnmower on is a cinch. Gone are the days when you have to pull a choke repeatedly to get it started. Now, it’ll start exactly like a car with the turn of a key. The special Hydro-gear transmission is pretty smooth, and it even has an integrated brake system. All in all, I found no problems with maneuverability or the steering of this lawnmower. A 46 inches mowing deck, in my opinion, is sufficient for most small to moderate size lawns. If you have a very big lawn though, I’d suggest getting one which has at least a 52 inches mowing deck. The triple blade mowing deck makes easy work of whatever shrubs and weeds that are growing in your lawn. When it comes to cutting your grass, it has 7 different cutting height positions, starting from 1.5 inches to 4.5 inches. Thus, whether you like a very closely mowed lawn or you like some amount of grass, this one lets you choose between both. I also really liked the fact that you can control the cutting height just by using your feet. A cargo bed is available as an optional accessory in case you want to carry around flowers or gardening tools. This accessory comes in particularly handy if you’re using it for commercial applications. However, I would definitely recommend this more for personal use and not for businesses, as this one is built as a mid-range mower. Even though Snapper 360Z is a mid range mower, it does come at a pretty price. Hence, you would want it to be durable and last you a long time. Fortunately for us, this mower’s construction is inspired by commercial models, which means that it has a completely welded steel frame, a particularly thick-walled front axle and a spindle made of aircraft grade aluminum. What’s most susceptible to damage however is the mowing deck itself. Snapper takes care of this problem by giving you a 14 gauge stamped steel mowing deck that can hold up to any amount of battering. Rest assured that this mower is going to last you for a good long time. What I disliked the most about this mower was that the mower deck does not come with a lifetime warranty unlike most other products in the market. Even the other lawnmowers in Snapper’s own 360Z series comes with a warranty on the fabricated mower decks. However, this product, on the other hand, has a commercial warranty of 90 days and a residential warranty of 3 years. Another detail that I was a little disappointed with is that the cargo bed and the armrest don’t come with the product itself. They are available as optional accessories. For me, I always require a cargo bed to carry around all of my gardening tools and I would pay the extra money to get it. The seat is comfortable enough. It is a 15 inches mid-back seat which you can adjust to your preferences. Does it have an hour meter and a fuel level indicator? It comes equipped with a standard hour meter, but you have to check the fuel level by sight. It can go up to 6 mph forward and 3 mph backward. The 360Z zero turn lawn mower comes equipped with all the features you would expect in a high-end lawnmower such as a fully welded steel frame and thick-walled front axles. Apart from the strong and sturdy frame and the smooth performance, what I liked best about this mower was the integrated rear cargo bed. So without further ado, let’s look at what makes this lawnmower tick. What I liked best about this lawnmower is the integrated 50 lbs capacity rear cargo bed. This gives it an added degree of versatility that is missing on most lawnmowers today. As an added benefit, the rails let you use aftermarket ATV accessories, and two pre-determined cutouts allow for easy insertion of a wooden 2×4 for an easily removable tailgate. Thus you can carry whatever you want along with you while you are mowing, whether gardening tools or landscaping devices. The whopping 52 inches mowing deck is made out of stamped steel and is guaranteed to last you a long time. The 3-blade mower makes a cakewalk out of cutting grass, shrubs, and any unwanted weeds on your lawn. Another feature which made my life so much more convenient was that the cutting height of the grass could be operated with your foot. The cutting height can be adjusted from 1.5 to 4.5 inches. I like to keep my grass cut short, so it works perfectly for me. However, some of my clients like it a little longer, and so the 13 different cut positions ensure you can get the exact height that you want. The 25 HP Briggs & Stratton professional series pours 725 cc of pure power into Snapper 360Z lawn mower, which makes it more of a car than a traditional lawn mower. Just like a car, this lawnmower has a Readystart functionality so you can turn on the lawnmower just by turning a key. The olden days of using chokes to power up your machines are long gone. The transmission is smooth, and steering is pretty easy. It even has an integrated brake. I guarantee that you’ll really enjoy going about your lawn sitting on the comfortable seats of this 360Z. The engine of a lawnmower is often indicative of how strong the chassis is. And if it’s rated for commercial usage, the chassis is definitely pretty tough. This commercially inspired lawn mower has a fully welded steel frame and a front axle which has exceptionally thick walls. The mower deck is pretty thick, and the ball bearings in the caster spindles make for an exceptionally tough lawnmower. This is the most expensive and most high-end of this series of lawnmowers. As a result, it comes equipped with all the necessary features, unlike other ones in this range. However, I was disappointed that even with all these features included, it doesn’t have an armrest and you need to buy it separately. For the price tag that this product carries, I definitely expected it to come with an armrest. Another detail I noticed about this lawnmower is that when you run it too fast, it is sometimes hard to stop even with the integrated braking system. This might prove to be dangerous if you have little children or pets playing in the field. The commercial warranty for this product is 90 days limited, and the residential warranty is 3 years limited. The fabricated mower deck has a lifetime warranty. How is the seat like? It is a 15 inches mid-back seat which is adjustable, so you can adjust it according to your preferences. The armrest is an optional accessory. Does it come with an hour meter? Yes, it is equipped with a standard hour meter. It comes with two easy-to-empty grass bags which collect lawn clippings and debris. You also get a grass mulching kit. From more power to more efficiency and versatility, the Snapper 24 HP mower was a delightful experience from the get-go. I found it to be highly mobile with easy to maneuver cutting features which can be further adjusted and customized. 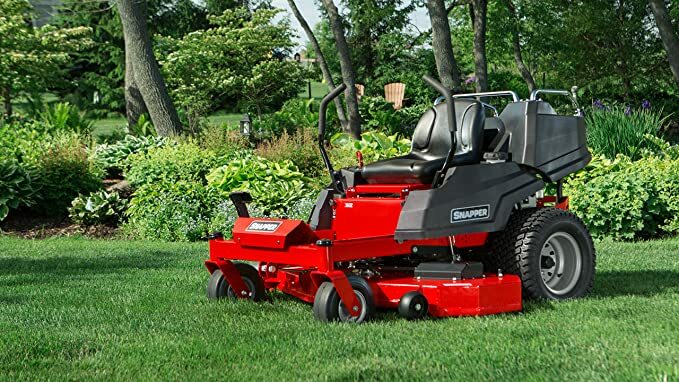 Do not be fooled by the Snapper mower’s demeanor; this little devil can pack quite a punch. And in my opinion, this zero turn mower is perhaps the fastest in the market. While zooming around the trellises, I clocked a maximum of 7 mph in the forward driving mode and 5 mph in reverse. This was only possible, as the mower features a 724cc Pro Series V-Twin OHV engine which is complemented by an equally ingenious full pressure lube system that has a spin-on filter. That, in turn, generates 27-horsepower, allowing the engine to provide enough power to the mower to reach that speed. The additional power makes the mower suitable for not just small and medium yards but a 2-acre large spread as well. The Snapper mower can help you achieve any deadline you please. And with its extreme efficiency and compact build, you cannot go wrong if you wish to choose it for both professional and domestic use. The zero turn ability of the mower allowed me to control each wheel individually. This made moving around the trees and trellis beds quite simple. Additionally, with the aid of the 52 inches wide deck and a 3-blade mechanism, I got a large cutting surface that significantly improved my mowing performance. What is a backyard garden mower if you’re not able to customize it to your needs? Whether I preferred to mulch, discharge, or collect the grass into a bag, this riding mower allowed me to use my own style of cutting whenever I wanted. And what was amazing was that when the neighbors asked me to cut differently around specific trellis beds, I found it quite easy to adjust to their needs. Varying from 1.5 to 4.5 inches, the Snapper gave me great versatility when it came to cutting heights. The heavy-duty pneumatic wheels present in the mower has seven adjustable cutting heights which I found to be suitable for all types of grass. And for more convenience, the cutting heights can be easily adjusted with the help of a single lever which is placed adjacent to the seat. Though an expensive gardening tool when compared to other mowers of its class, the Snapper 24HP helps you save up in different ways. What I found to be quite unique to this mower is how fuel efficient it was. The mower is provided with an Electric Fuel Management system that continually monitors the engine. It periodically maintains the speed, temperature as well as the time to regulate the air and fuel mixture to improve fuel efficiency. You will be able to save up a lot in the long run. 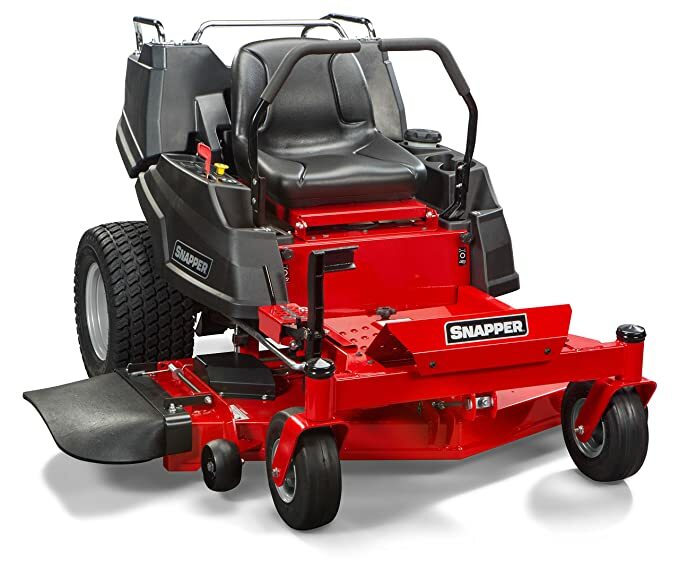 The Snapper 24 HP is much more expensive than mowers which belong to the same category. The mower is pretty robust and durable, but it needs a lot of maintenance. If you’re able to do it yourself, then so much the better. But otherwise, it is another cost you will have to sustain. Sure it’s great to be able to control each wheel separately, but the zero turn feature decreases the traction and stability of the mower especially in sloped, bumpy or wet terrain. Customer service was not as good as I initially expected. Will the Snapper 24 HP allow me to mow in reverse? Yes! With the help of the 724cc Pro Series V-Twin OHV engine, you will be able to go as fast as 7 mph in the forward driving mode and 5 mph in reverse. Will the Snapper 24 HP arrive at my front door fully assembled? That is a yes. When it reached my doorsteps, it was almost fully assembled apart from the handlebars, which just takes a few moments to attach. Can I mulch with this mower? Whether you prefer to mulch or collect the grass in a bag, you’ll be able to do it all. When it comes to efficiency and maneuverability, the Snapper zero turn riding mowers have all their competition beat. Even with the cons, their advantages are capable of trumping all criticism. For professionals or just home backyard enthusiasts, if you don’t mind the cost, then these mowers come highly recommended from my side. I hope you enjoyed my mower review today and found it helpful when choosing the right mower for your needs.